Yesterday was Independence Day. While I was reading newspaper the prominence of tricolour of our Indian flag in the paper just gave me the thought to cook something tri colour in kitchen today. So with momie’s help came up with the idea of cooking trirangi briyani. 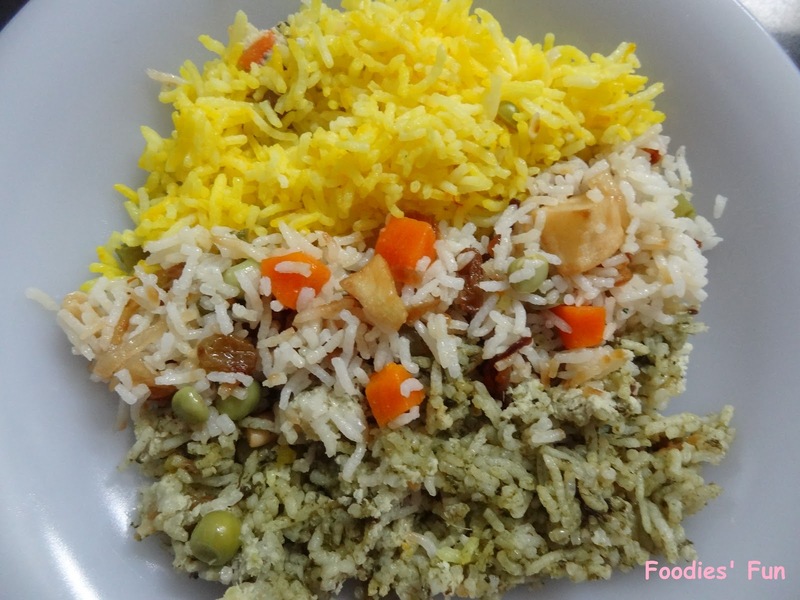 Wash and soak rice in water one hour before making the briyani. 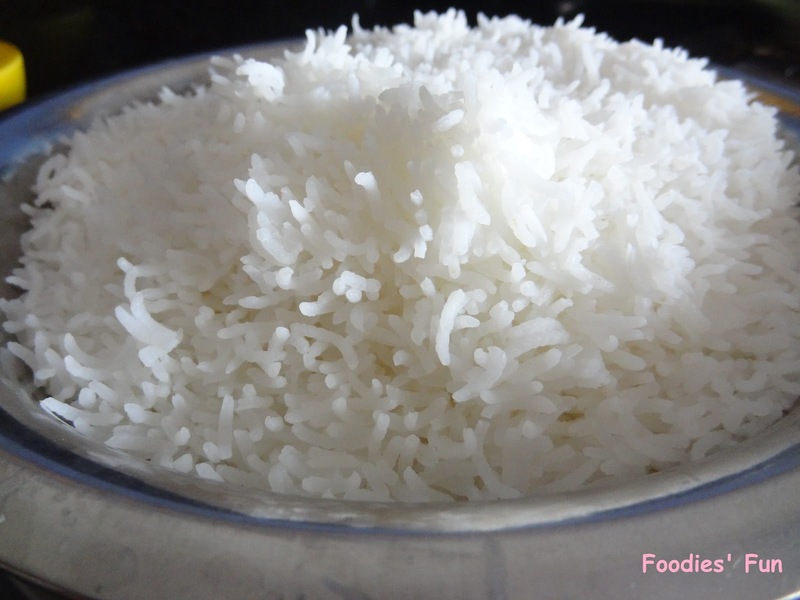 Boil the rice along with little salt in it in a cooking pot. This will take about 10 minutes. Drain off the water and let it cool. 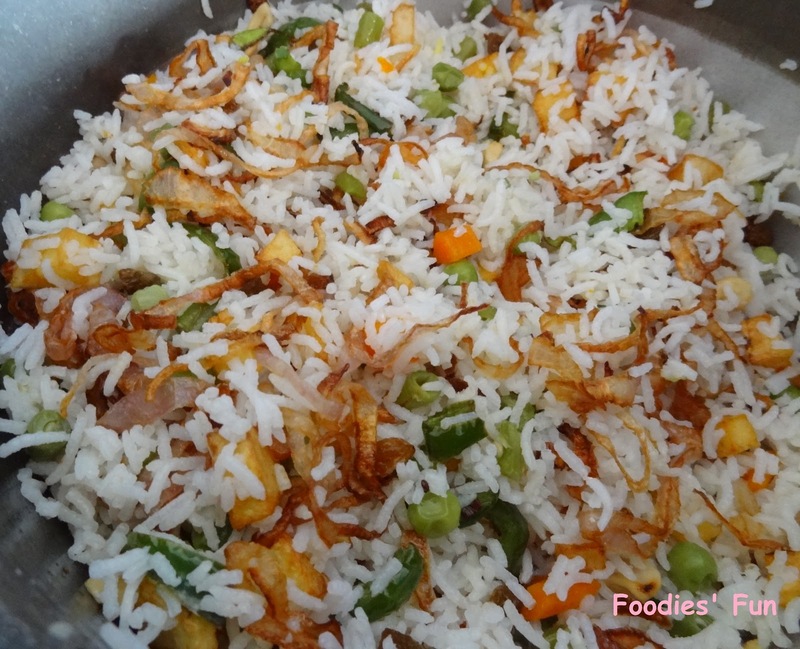 Side by side cut carrot, french beans, potato, onion, capsicum & coconut. Also sort out spinach leaves properly. 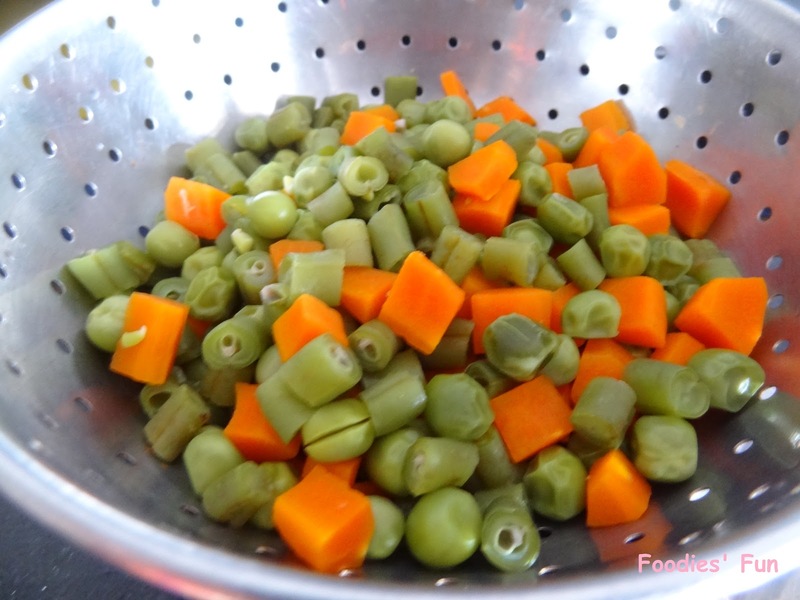 Boil carrot, french beans & peas in a cooking pot. This will take about 5-7 minutes. Drain off the water and let it cool. 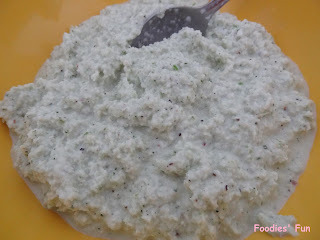 After basic preparation is done, make coconut chutney. In a mixture grinder put chopped coconut, curd, onions, garlic, ginger, green chilli, curry leaves, pepper seeds and salt. 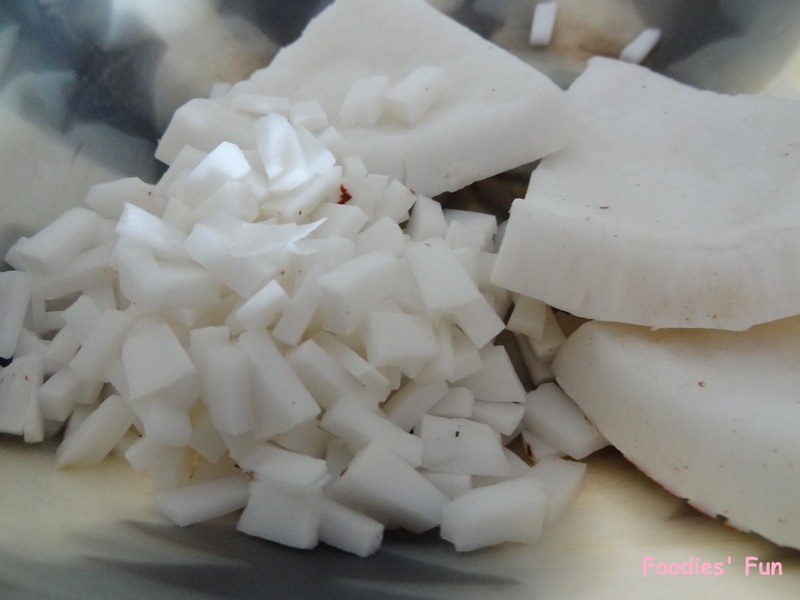 Blend it properly to make a thick paste. Take it out in a bowl. In a small frying pan, put oil and let it heat. After it heats up, put cumin seeds and hing to it. Let it pop properly. Switch off the stove and add this to the chutney. Mix it well. 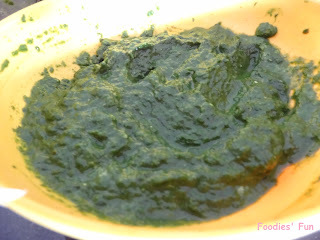 Grind spinach in the mixture grinder. Take it out in a bowl. We will use this for adding green colour to the rice. Also take a small bowl, put little milk in it and kesar in it. Grind it in traditional way. 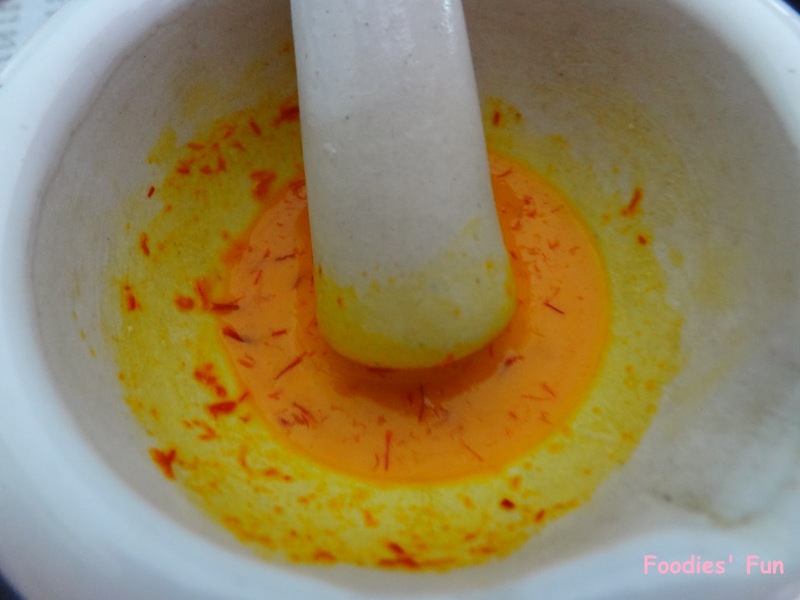 This syrup will be used to give yellow colour to the rice. Take a kadai. Put oil in it and switch in the gas. 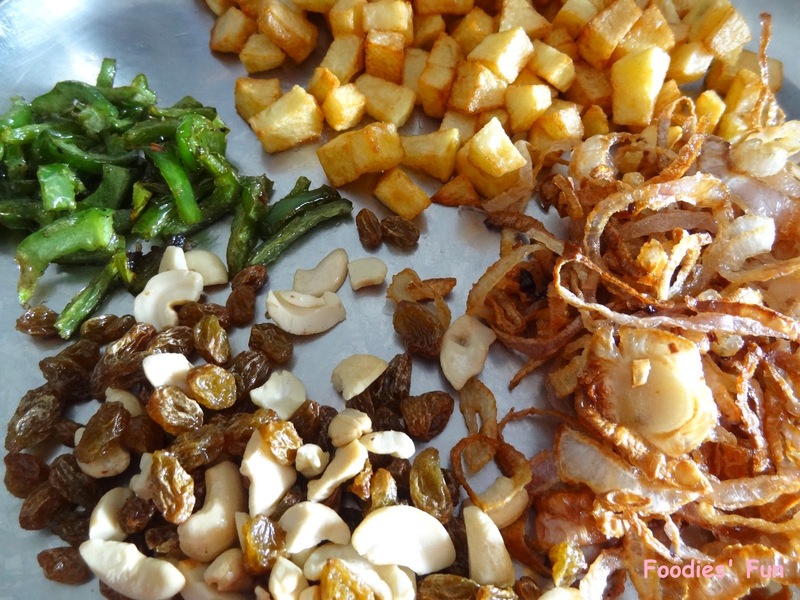 After oil heats up fry diced potato, onion rings, sliced capsicum, raisins & cashew nuts one by one. This will take about 25 minutes. 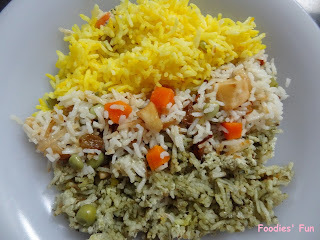 Let’s begin giving different colours to our rice. In case you have not divided the boiled rice in three equal parts. Do so now. To one part of the rice, add spinach paste and salt. Mix them well. 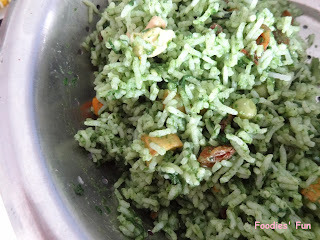 This readies green coloured rice. 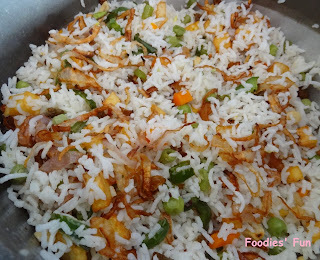 To second part of the rice, add boiled and fried veggies and dry fuits and salt. White coloured rice is ready. 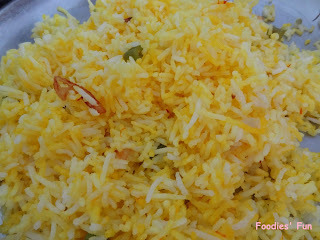 To the third and last part of the rice, add kesar and salt to the rice. With this, giving three different colours to rice is complete. Finally assemble the briyani in a cooking pot. First make a layer of palak rice (green colour) at the bottom of the cooking pot. 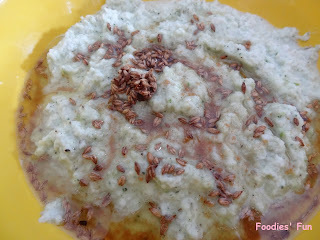 Then spread out a layer of coconut chutney on it. Now make a layer of white coloured rice on it. 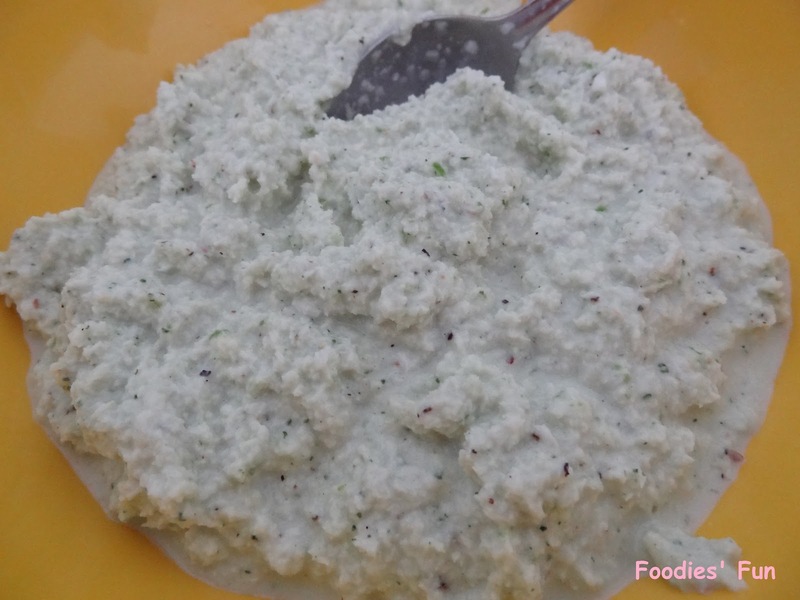 Again evenly spread out a layer of coconut chutney. 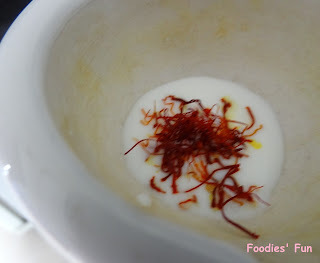 Lastly make a layer of kesar rice (yellow colour). On a low flame, heat the cooking pot with the lid closed for about 5-7 minutes. Leave it for some time. 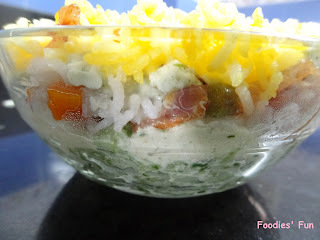 Serve yummy tri- colour briyani in a plate.